What a brilliant usage of the medium ! Grey,the agency behind this stunning Guerilla in India is ready to reap metals. The effort for Childcare, India aims to help more than 20 Million Indian Children who beg on the streets each day.I can say that is a fun and creative ad ..PUSH ! My God, how could one make this at home? Having just returned from India I'm not exactly sure what the point of this is. If the point is to simply raise awareness, I think the campaign money would be better spent ON the children. If you walk the streets of India and are somehow not aware of the very real begging children, lepers etc that are around you constantly, I'm fairly sure a printed ad would sway you any further. Why do I feel people would just grow desensitized to these posters of the kids, and after a while, ignore the real life kids as well? Poverty awareness is neccesary in India the same way cold awareness is neccesary in Antarctica. You can't even walk down a street in NY or Chicago without getting panhandled ten times. India is several magnitudes more impoverished. You literally get off the plane and walk into a crowd of beggars. Fund job education programs, food, economy-stimulating activities. Adopt a child. Encourage birth control. Anything. 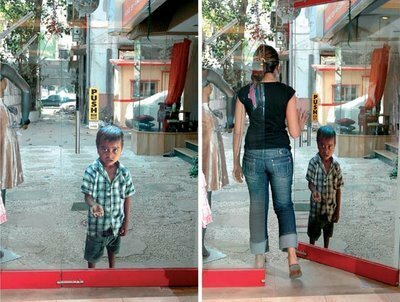 But the most these pictures can hope to accomplish in India is to camoflage the glass doors among the crowds of actual begging children. does the image only come in male? I'm an indian, my outlook on why male children are used is cause the society in general is biased towards the male child. 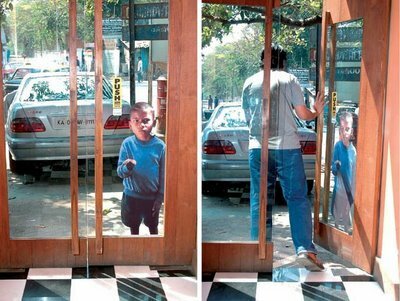 People get more concerned if it is a male child begging rather than a female kid. Yeah, I know it sounds ridiculous but thats how it is. you can google female infanticide. The advertising agencies in India are very enterprising, infact some of the most famous names in advertising are from there. Advertising in India has always a visual appeal, because for an ad to target each and every of those 1 billion people who speak a language or two from the 22 officially recognized languages, come on it has to be visual. haha..thats funny and smart. my country also having that kind of problem. I think there should be a second campaign where all the ads currently displayed are replaced by something very similar but more shocking or with a clear message. This will make people stop and think as, for a while, they've been "accustomed" to the photos of the kids. Interesting and very creative marketing idea, although I think it needs to be a little more clear of what they are trying to advertise. I wouldn't think anything of a postered child on a window. That is indeed very conceptual.